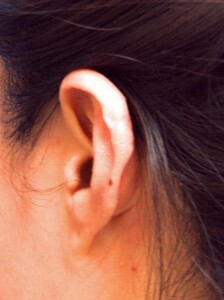 Keloids of the earlobe and the ear in general are very common and do occur in all ethnic groups. They can range in size from fairly small and discrete to large, deforming, painful and attention grabbing. What they all do have in common is their conspicuous location and unwanted presence. Though some keloids of the ear and earlobe have a very high predilection to recur and are quite challenging to permanently eradicate, most can be treated successfully with a combination of plastic surgery, steroid injections and postoperative monitoring for any signs of regrowth. 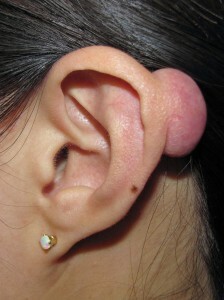 The surgery typically involves complete removal of the keloid and reconstruction of the defect in order to obtain as normal appearing an ear or earlobe as possible. Concurrent with this, I will injection an effective dosage of steroid medication that serves to suppress the risk of regrowth. It is then important to keep a watchful eye for any signs of recurrence as this is more likely to happen within the first year and a half after treatment. If identified early, a strategic amount of a steroid medication injected into the area is usually effective in controlling and reversing this keloid regrowth. Unfortunately, many patients do not take this postoperative monitoring part seriously so they do run the risk of the keloid growing back to a size that can be as big or even larger than the original one. The following patient of mine illustrates a few of these issues. 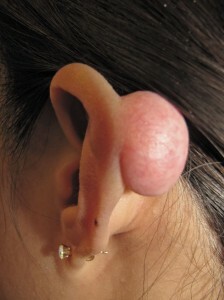 She is a 24 year old female who had a keloid of left ear for many years . It was first treated three years ago with a steroid injection by her physician but there was no follow-up monitoring. Consequently, it re-grew to a far larger size than it was before her treatment. Another physician attempted laser treatments but they were predictably unsuccessful. 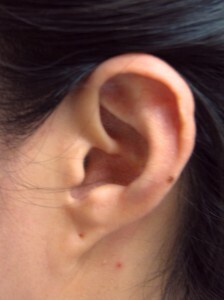 The size of the keloid of the left ear when she saw me in consultation was 2.5 cm, or 1 inch (Fig. A and C). My treatment for her consisted of complete excision of the keloid under local anesthesia, reconstruction of the defect and an immediate steroid injection (Fig B and D). Sutures were removed at one week and she was started on a silicone scar cream at 3 weeks. Monitoring her every one to three months, she has shown not even the slightest evidence of a recurrence. If you would like more information on the treatment of keloids or on any other plastic surgery procedure that I perform or to schedule a consultation with me, please call my office at 480-451-3000.